In part two of John Riley’s beginners’ guide to photography he shows us how to set up a digital workspace. Now we have our file structure organised (see Part 1) we need to set up the workspace in our chosen editing program. This is usually achieved through the use of some sort of Image Browser. Here are three approaches using various types of Photoshop. 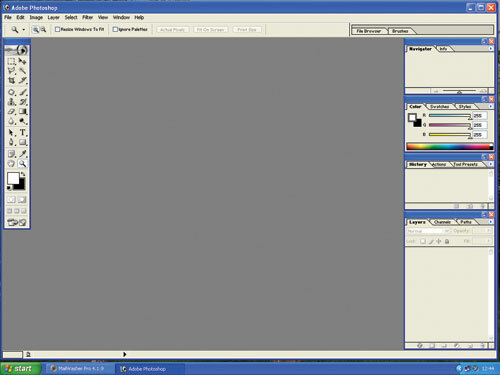 Photoshop 7 uses an integral File Browser that is part of the program itself. To start, go to Window>Workspace>Reset Palette Locations and you will start from the default setting of the workspace. edges out of the box to enlarge it to fit the workspace. You can select files (images) from the menu tree on the left or by double clicking a displayed thumbnail. This is my personal preferred way of working. The CS range of Photoshop brings a new file browser that is a stand alone program called Bridge. This is very similar to the File Browser of PS7 but is already a large window and has more display options available. Edit>Preferences>General and tick the box that says “Automatically launch Bridge”. In Part 1 we used Windows to organise our file structure and it is also possible to use it to find and select images. Here I show how that looks in Elements 7. Just go to File>Open and the usual Windows box will pop up. If you look at the options to the right of the folder location box then the item far right will give you a pull down menu. One of the options is Thumbnails and if you click this you will see some fairly small thumbnails instead of the list of files. This is useable to identify what pictures are in a folder, although not as good as the Photoshop options. There is of course the Photoshop Elements 7 organiser too, but this is not our emphasis here. Photoshop 7’s File Browser. Photoshop CS2’s Bridge. Photoshop Elements 7 workspace. We have looked at some ways to identify and select the images we want to work on. Next time we will start the image editing process, looking first at cropping and resizing and keeping within the brief of describing a simple way to process our digital images. This is a very great post and the way you express your all post details that is too good. I am a graphic designer and working in a website development company as a graphics designer.